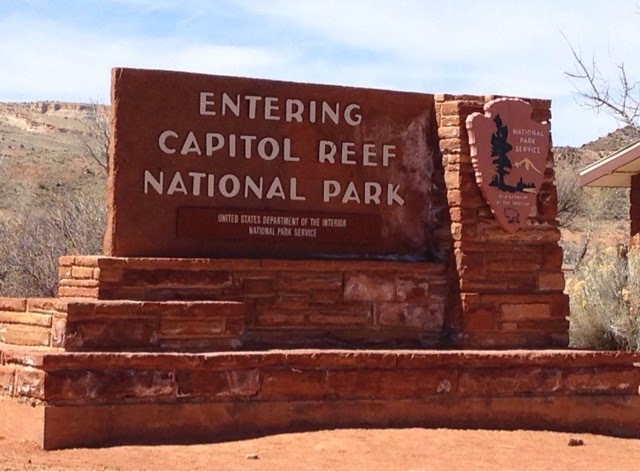 The drive was long as you have to go north to I70 then west on it for about 4pm miles then south again for about 90 miles to Capitol Reef. Soon after getting on I70 west I came across a large car rolled over in the median landing on its side. It looked like it rolled at over once ending on its side. There were a dozen cars and trucks that were stopped and a crowd at the side of the car. It must have happened in the last 10 minutes as there were no emergency vehicles on scene. I continued on my way as there were enough people. About 5 miles from the accident I came upon a Utah State Trooper heading to the accident. The whole thing made me think that my EMT expires this month, having had it for the last 16 years. After I left being Fire Chief I decided that I had no place to use my EMT so I would let it go. Massachusetts had also changed the regulations requiring that you affiliate with an ambulance service. 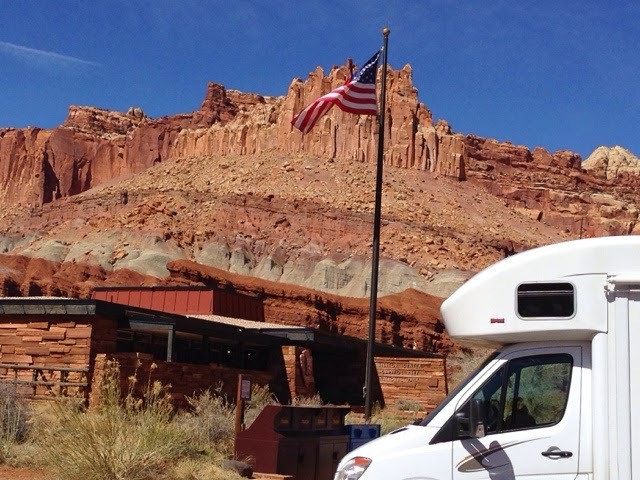 I arrived at Capitol Reef NP and unlike other National Parks that have a booth to check in this one doesn't. I drove to the campground taking a couple pictures on the way. 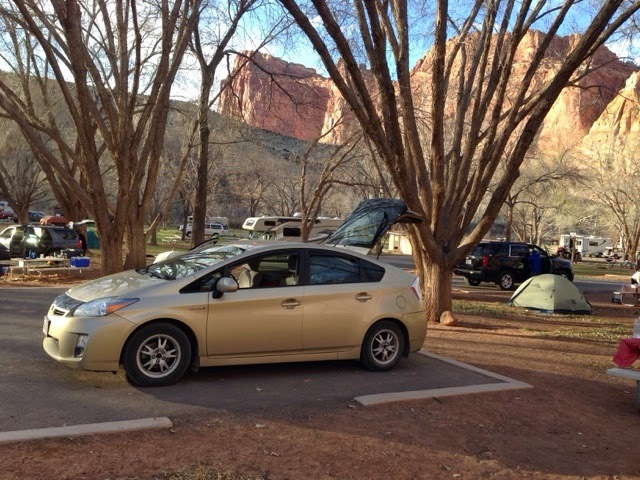 It was about 2:00 pm and I got a campsite for the night. After paying my reduced rate of $5.00 to camp for the night I went to the visitors center to ask about a 2 hour hike. I picked Cassidy Arch. 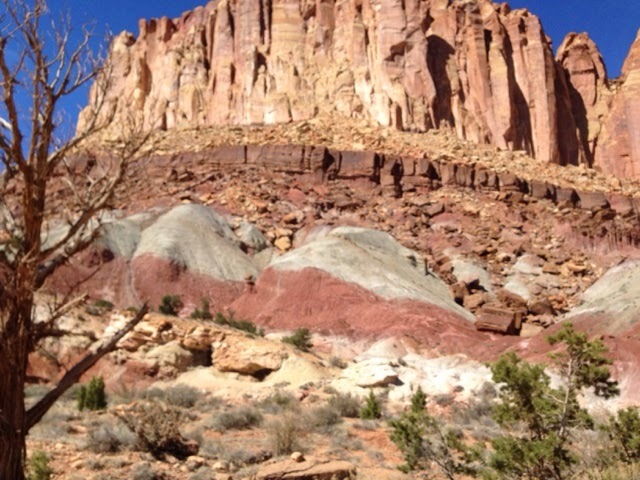 There was a short ride on Scenic Drive to get to Great Wash Road. You drive down the road crossing the wash many times to the end at the trailhead. 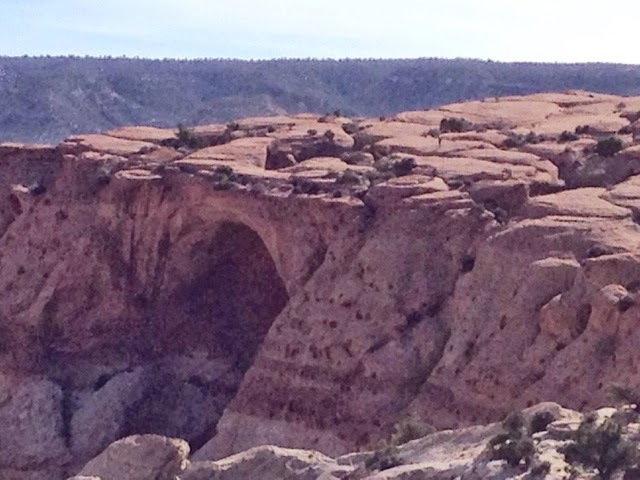 There are 3 hikes from here including Cassidy Arch. I met this couple from Colorado in the parking lot and they were headed to the arch too. They had rented a car to from drive over as they didn't want to dirty or ding their car. He commented that I had a Gregory Backpack in away that he was impressed. He said he had a Gregory but larger and he showed me his department store backpack making apologies for it not being that good. I could see he had a GPS on his hip and as we head down the trail he says you know we will probably will not stick together for the hike as we may not hike at the same speed. I got the message so they were a couple hundred feet in front of me and I could see him checking his gps as we walked the wash looking for the turn to start hiking up the hill. We both figured we had missed the turn. I had been looking for the sign I was told by the ranger to look for, but had missed it. We start heading back now I'm first and I find the sign and let them know. Then I just left them in the dust. I have climbed and although I'm not the fastest I was ready having only hiked 4 miles this am. 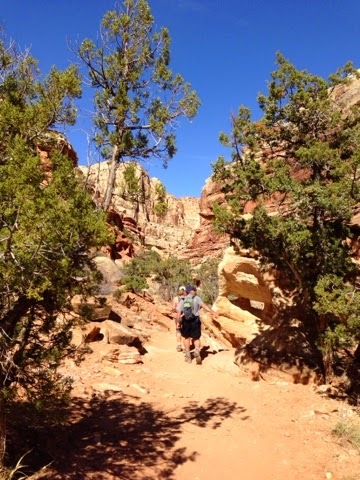 This 4 mike round trip would be harder as it is up a steep side of a gorge, but his attitude gave me purpose. 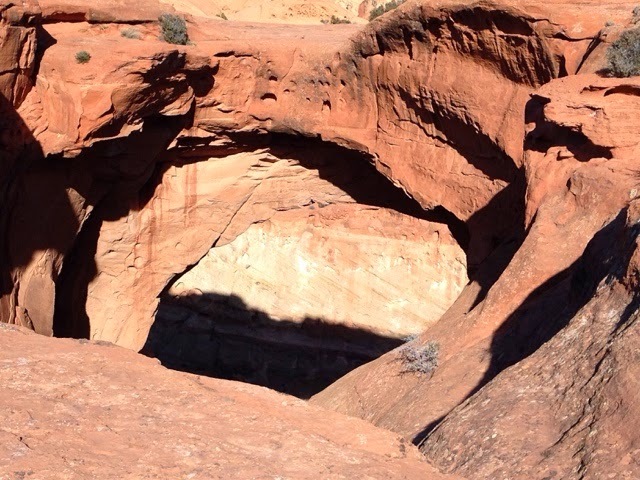 I got to Cassidy Arch and took my pictures and headed down. I met the couple still on their way up and I got the impression that they were thinking about turning back so I showed them the dome that they had to go over and they decided to go. On my way down I could see the arch and they were on it. For me it was pushing 5:30 pm and wanted to get back to camp for the evening. You can see the arch off to the left - it looks black in the hole as the sun is setting. 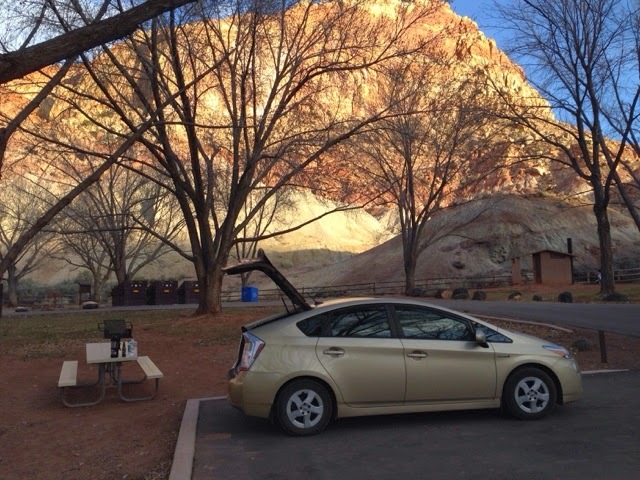 I walked around the camp and here is the Prius with womderful views.